This Memorial is included in our Tidal Basin/Cherry Blossom Tour. Listen to a preview here and download this stop by itself or as part of the full tour! Behold the Jefferson Memorial. A firebrand of the written word, Thomas Jefferson penned the very document that gave rise to a great experiment in Democracy and to an 8 years long war -The Declaration of Independence. Holding many important positions and helping to cast America as a new, powerful force in the world, Thomas Jefferson had a monumental impact on modern society with his many famous political successes and material inventions. Surrounded by Cherry trees, the Jefferson Memorial, a great symbol of liberty, stands on the southern end of the Tidal Basin, allowing it a uniquely unencumbered view across the water towards the Washington Monument and the White House. 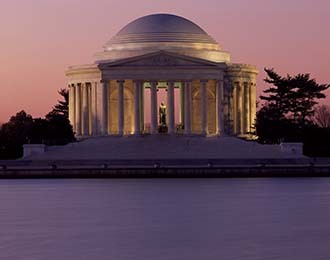 Learn the stories behind the man and the memorial on our Tidal Basin & Cherry Blossom Tours.